It’s a busy Saturday (Go VT Hokies!) and I’ll be taking lots of wedding reception shots in a couple hours … so why not a couple of the trestle first? 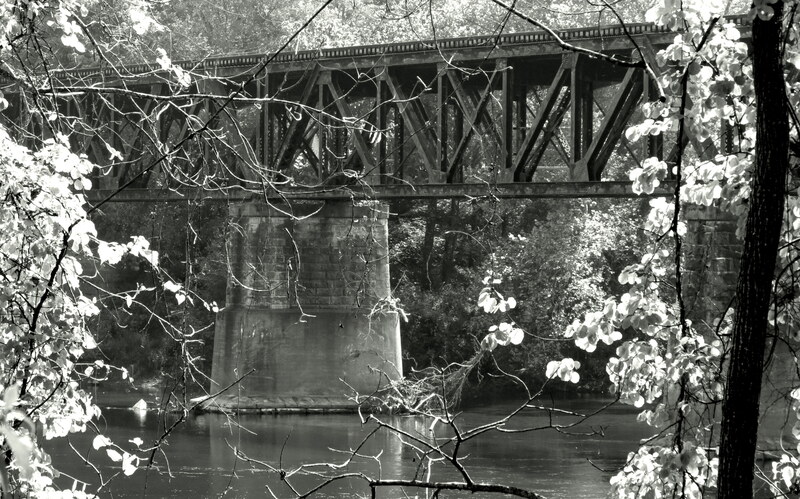 This entry was posted in Black and White, Color, Photography, Trains and tagged Black and White, Donnie and Marie, Train Trestle, VT Hokies!. Bookmark the permalink. I almost mentioned you in the post, Joe! I had a feeling you’d remember that song 🙂 I too think the color is the best. Off to photography the reception! I much prefer the composition on the B&W. You are exactly right! And I hated that those branches were in the way … and if I’d had more time, I would have crawled down the bank to get in front of them. B&W! I love black and white because it allows you to focus on the details without the distraction of the color. The vines against the man made structure in this composition really popped! You know what, Lynda, I went back and had a good look and they DO pop! Thanks for directing my eye to it. Each photo could stand alone… Hope the photos came out well! I think the reception photos reveal a roomful of family, friends, and happiness. Are they anything to brag about? Probably not … but they are fun anyway. Thanks Heather. I too think the color is nice. 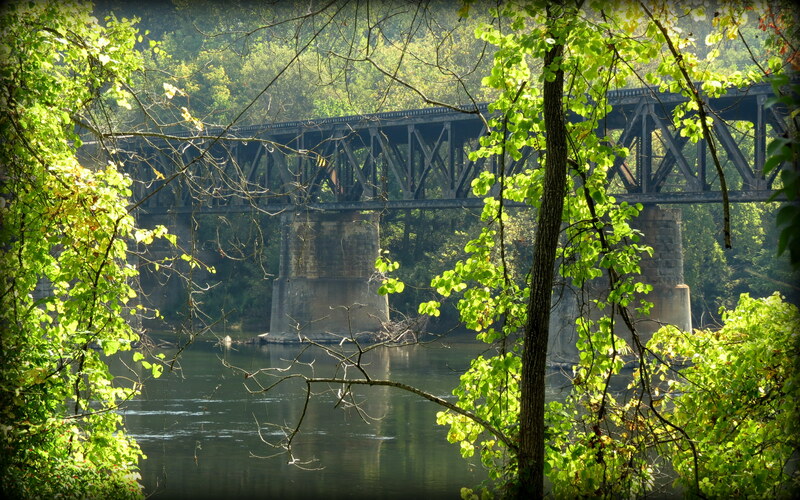 The brightness of the leaves somehow make the trestle stand out . Thanks. B&W seems to be the top choice! Robyn, I appreciate you saying that. I was wondering if they light on the leaves was too bright. I can’t decide. As has already been said, there are different reasons to like both. The shot really lends itself to black and white because of the bold shapes and the light on the leaves. I feel like the colour image does a better job of pulling the trestle into a focal point, since the small branches in the foreground fade away. I actually like the way the trees and leaves frame the trestle and give more interest to the foreground in the color photo, it’s a much more pleasing composition and shows so much more of the trestle. I took the color photo and converted it to B/W and without any other processing I like it even more. The application of a couple of subtle filters can really make it pop. Wow Ken! I”ll have to go check out the conversion to B&W! Sounds like you know what you’re doing. Thanks for the comment! While I appreciate the shadows and light in a good black and white, I’m always a sucker for vibrant color. Beautiful. Thanks for sharing. Thanks Alys! It’s been fun to hear all the opinions! Beautiful – both of them. My first thought was, why choose? They are both terrific. My second choice was the black and white. Then, after I left the screen and came back, I have no doubt that the color photo is tops. I’m sticking with it. Love that process 🙂 Thanks so much for the comment and visit! I’ll be checking out your blog in a few! 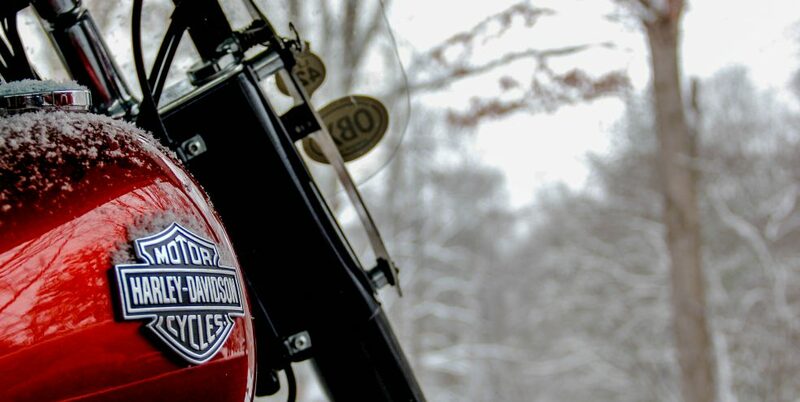 I’m a little bit country AND a little bit rock ‘n roll. I like both photos, but being in love with vibrant color I do so love the color shot best. Isn’t it amazing how each has a completely different feel? As though there were two different places entirely. I have a soft spot for black and white photos. Nice shots! I’m so behind from being away. Catching up now and yep, mmmmm I actually like both your photo’s for different reasons. The coloured photo seems so vibrant and alive, makes me think winter is far far away. The B&W has so much depth though and seems to speak to me of the past, where train travel was more prevalent. I really can’t pick a favourite. Hey, how’d the wedding go? The candid ones are always the best. My hubby and I take terrible pictures, we’re always smiling like Chandler Bing (If you remember that episode) HA. Maybe you can parlay this into a retirement side thingy! Thanks … it’s a very old train trestle … from the early 1800s. Pretty cool!